I’m far too ginger to ever have languished on a beach reading a novel and working on my tan, but if I ever had, I imagine this is just the sort of book I would want to read while doing it. Partly set in the 1800s, partly in the modern day, this book explores social mores, love, marriage and relationships. It isn’t a challenging read in any way, but it sort of chugs along merrily, more or less keeping your attention, towards a happyish conclusion. The historical detail was interesting, although the frequent diversions into military history were not my thing. The story, set in the 1800s, follows Stephen Fairhurst, a former military man, who is trying to adjust to civilian life. When we first meet him he has just been turned down by his prospective fiance as she is repelled by him having lost a leg in the war. We follow him on his journey facing up to the demons that haunt him and searching for love while always trying to do the decent thing. Then, in the modern day, we follow Anna, the emotionally neglected 15 year old, who is packed off by her mother to spend the summer with her uncle in an abandoned school set within an old manor house. It turns out that the manor house is the same place that Stephen Fairhurst lived, so she acquires some of his old letters. Anna is freaked out by the empty house and her creepy grandmother and spends increasing amounts of time with the artistic couple living in the house next door. They teach her photography and eventually she learns more than just that in a classic coming of age tale. Both stories were interesting, but they didn’t really connect to each other very much. Anna’s reading of Stephen’s letters seemed a bit pointless. They didn’t add any insight to her story and she didn’t seem that interested in them anyway. But, individually both stories were entertaining enough. I don’t really know why it was called the Mathematics of Love – it had absolutely nothing to do with mathematics. There is one line it that goes something like “so love is a bit like mathematics” (or something) but that was the only reference. All in all, this is a good holiday read, but it won’t rock your world. Tags: book review, books, emma darwin, Fiction, holiday reads, love, love story. Bookmark the permalink. 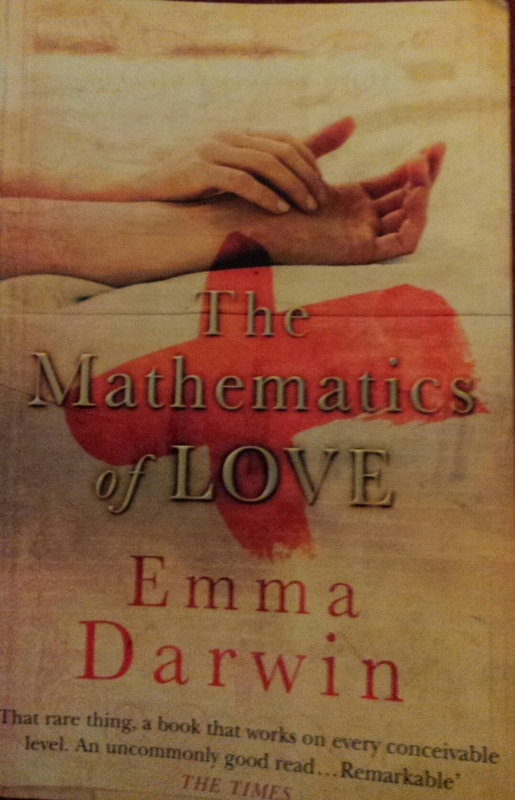 So why was the title the MATHEMATICS of love? Beats me. There was no mathematics in it at all. There’s a plus sign on the cover?